We’ll be joining our neighbors at graf lantz during their Friends & Family Sale. 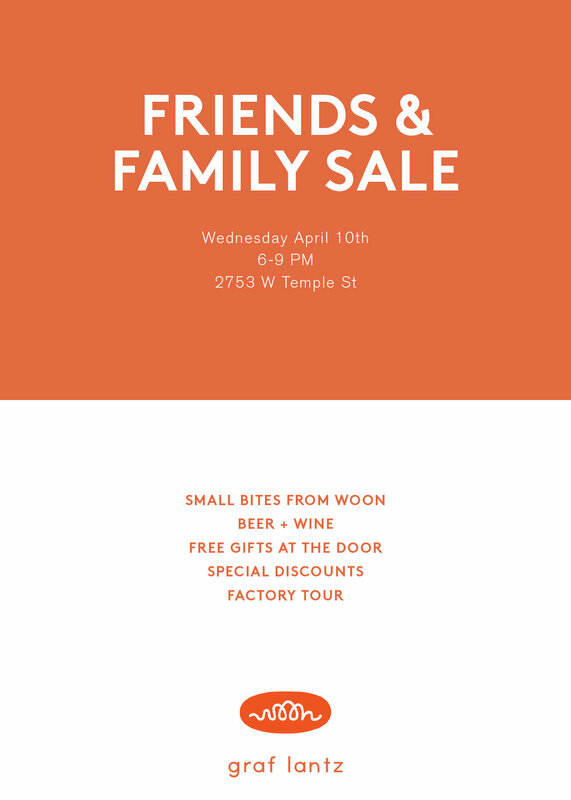 Swing by to shop some quality goods at a discount and enjoy some Pork Belly Baos + Cucumber Tofu Salads. Miss us? We're popping up at our favorite bar, beer garden and music venue, Resident in Downtown LA Arts District on Saturday, September 22 at 7pm. Come enjoy our Beef Noodles and Veggie Noodles and head inside for a dance party afterwards. Noodle doodle by Seth Barnard. Some moving scenes from the opening night of 1700 Naud by Monster Children & Pabst Blue Ribbon. Once again, we're popping up at our favorite bar, beer garden and music venue, Resident in Downtown LA Arts District on Friday, May 18 at 7pm. Come enjoy our Beef Noodles, Veggie Noodles and Pork Belly Baos. Resident will be curating a selection of drink specials to pair with our menu. That night will be one of Resident's favorite nights, Juke Joint (Soul Night), and it's free! So come eat some noods and then head inside for an all night dance party. Jasmin Blasco (Dublab) on the Woon cart. Mama's Way is the best way. Thanks for the tasty drinks fueled by The Real McCoy Rum. Bruno, our trusty old Woon van. We'll be serving Beef and Veggie Noodles + Pork Belly Baos at Downtown LA's bar + coffee shop, Mega Bodega. Our friends from Salamat Ceramics will be selling some special pieces just for your noodle and bao pleasures. We'll be there 8pm - late, so bring an appetite for noods and soju shots! Save the date for Saturday, August 13th. We'll be having our next Pop Up Kitchen at Mega Bodega in DTLA. Stay tuned for details. We can't wait for this one. We'll be popping up on Saturday, February 20th at Downtown LA Arts District's newest venue Resident. If you haven't been there yet, you'll want to check it out...they have an outdoor beer garden with Italian string lights, heated concrete floors, picnic tables, and a vintage Spartan trailer outfitted as a fully operating bar. We will be selling our Beef or Veggie Noodles outside in the beer garden which is FREE and open to the public. Inside will be live music by Charlie Hilton (singer of one of our favorite bands, Blouse). Tickets for the concert are $10 and can be bought ahead of time here. Bring your appetite, dancing shoes, and booze. As always, our Beef or Veggie Noodles will be served and we'll be offering a Pork Belly w/ Steamed White Rice option. Suggested donations. Always a special thanks to the guys at Pico Studio for hosting our Pop Up's.